Some additonal information on moth and butterfly symbolism will help us finish up on figuring out the hidden plot in The Silence of the Lambs. As already observed, Lecter expected Gumb to be using butterflies - recall that he asked Clarice if the object found in the West Virginia girl's throat was a butterfly. As stated earlier, Lecter must have known about the carton of live caterpillars stopped at Los Angeles International Airport ('LAX'), from Crawford having told him about it (i.e., Crawford knew about the stopped shipment for some time before he notified Starling of it, from his plane, near the end of the movie), and the carton had been shipped via Suriname, a country known for its butterflies. The butterfly is a symbol of resurrection. [a] According to Jung, resurrection is a form of rebirth in which human existence is re-established after death. [b] As described in parts 2 and 3 of this unified analysis, Lecter wants to experience rebirth. Lecter's actions in Memphis (staging his 'death' in his cell area, then his self-'recovery' in the ambulance), are his attempt at resurrection/rebirth. The fact that Gumb (representing the Freemasons) wanted to 'cheat' Lecter (representing evil hermaphroditic Jews) out of his planned resurrection, is part of what is symbolized by his use of moths instead of butterflies. Lecter's attempt at resurrection in The Silence of the Lambs. Top left: Jame Gumb visibly exhales blood upward just before he dies, after Starling has shot him in his basement. Top right: The wind twirler hanging from the ceiling in Gumb's basement, depicts a butterfly flying among flowers. 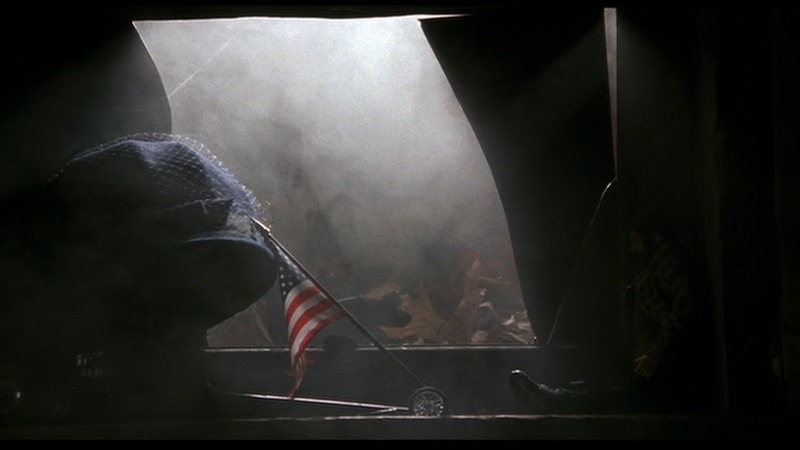 Above left: As evidenced by the military helmet, small American flag, and toy soldier in Jame Gumb's basement window sill, Gumb must have been in the armed services at some point during his life. Above right: The crutch placed near the ceiling in Gumb's basement, indicates that Gumb may have been a disabled veteran. Unlike the butterfly, the moth symbolizes "the soul seeking the godhead...attracted like the insect fluttering round the candle until it burns its wings. "[e] That Gumb decided to use moths symbolizes not only that he wanted to cheat Lecter out of his planned resurrection, but also that he himself wanted to become a kind of 'god' via becoming Satan personified, usurping Lecter's place in this respect. Also, as Lecter told Clarice, "the significance of the moth is change"; it seems obvious that Gumb wanted to change (into a woman). The original plan worked out between Lecter (Satan/evil hermaphroditic Jews) and Gumb (Satan's pupil/Freemasons), was that Gumb was to work under Lecter in creating the skin suit, with the idea being that Lecter would undergo the above-mentioned rebirth, and that he would rule over the 'kingdom' (representing the planned utopia in southern Indiana) that would have resulted had Gumb completed his act of creation in accordance with the pre-established plan (i.e., by using only seven patches of skin to complete the suit). Gumb, in trying to deceive Lecter, ultimately had in mind that he himself would rule over this kingdom. Roden and Pilcher (shown at left, with Roden holding the bottle containing the moth cocoon Starling brought to the Smithsonian), who were working for Gumb, would have known that Starling might tell Lecter that the object found in the girl's throat was a moth, so they told her the species found was Acherontia styx, which is from Asia (and would thus have come into the U.S. via LAX), instead of telling her the truth, which is that the species is A. atropos; then, if Lecter had found out the name of the species of the moth from Starling, he wouldn't have a problem with the species name, since as we've observed, Styx is the name of an underworld river (i.e., it is a river in Hell). If Lecter found out Gumb was using atropos, however, he would have become suspicious: As mentioned previously in the hidden plot thread, Atropos was the name of the cutter of the thread of life; the idea of cutting thread is more closely related to what Gumb himself is doing, i.e., his sewing, than is the name 'styx', so Lecter might figure out, based on this symbolism, that Gumb was interested in himself getting the upper hand. Gumb was having the A. atropos shipped to himself via the East Coast, since this species is native to the Mediterranean and Middle East regions. It was atropos that Gumb inserted into the West Virginia girl's throat. However, Lecter was dependent upon Starling to tell him about the cocoon, and she would have written in the case file what Roden and Pilcher had told her, that it was A. styx. 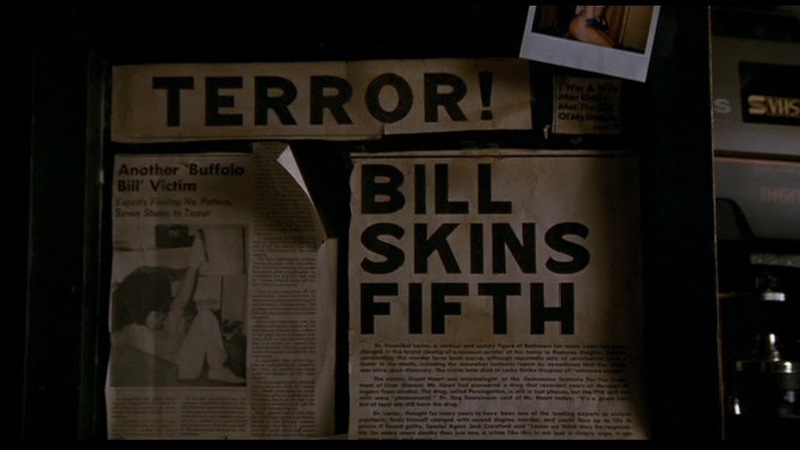 Near the end of the movie, just after Starling shoots and kills Gumb, we see a newspaper page on one wall of Gumb's basement (shown at left), with a headline that says, "Bill Skins Fifth". Thus, Gumb himself knew by some point, that Frederica Bimmel's body had been found, so when he found out (via someone working at the FBI, as will be discussed below) that his sixth victim's body had been found, he realized the FBI (and Lecter) would know the true number of victims, and therefore, he knew he had to have Roden and Pilcher deceive Starling on the name of the moth species. The idea is that Gumb would know that Lecter would realize, due to the use of A. atropos, that the reason Gumb was tricking him, was so that he himself could become a personification of Satan, and rule over the planned evil kingdom, usurping Lecter's place in these respects, as indicated above. As stated, Crawford didn't tell Starling about the stopped shipment of caterpillars until some time after he found out about it: He was working against Starling, so he held off on informing her until the time was right for her to be 'led' to Gumb's house. The reason Starling mentioned to Lecter in their third meeting, that the fact that a moth had been found in the West Virginia girl's mouth had not yet been made public, means that Roden and Pilcher could not have heard about the moth when they heard about the girl in the news. Also, since they heard about the case on the radio, they could not have seen a picture of the moth cocoon prior to Starling bringing it to them, as they might have if they had seen a television or newspaper report on the case. The point is that they knew to deceive Starling on the moth's species, based solely on communication with Gumb (or someone else working with him). Recall that just after Lecter 'hijacked' an ambulance after his escape from his cell in Memphis, Ardelia was shown running from a dangling payphone receiver (shown at left) in the hallway of her and Starling's dormitory; then next, she met with Starling and told her that Lecter was on the loose. The point is that it must have been Crawford on the other end of the phone, telling Ardelia about the events in Memphis so that she could tell Starling about them. Crawford must have specifically asked for Ardelia when he called, since the phone was located in a commonly traversed area of the dormitory, and therefore, any random trainee living there could have answered it. Crawford didn't want to speak directly with Starling - he knew Starling must hear the contents of his message from Ardelia since, as explained in part 70 of the Silence of the Lambs analysis, Ardelia was Starling's Jungian psychopomp, and could thus influence Starling's mind. Recall that Benjamin Raspail's head (shown at below left) was found by Starling in Lecter's storage unit, then later in the movie, Starling informed Lecter that a moth was found in the head. To determine the kind of moth cocoon it was that was found in Raspail's head, we first note that in the scene inside Gumb's house (in Belvedere, Ohio), Gumb was holding a moth with a lot of gray coloring in its underside (shown at below right), unlike the yellowish coloring of A. atropos. The moth Gumb is holding here is a specimen of A. styx, the point being that Gumb had, over some time period, been having this species shipped to himself. Above left: Benjamin Raspail's head. Above right: An Acherontia styx moth being held in Jame Gumb's hand, while Gumb was living in Belvedere, Ohio. What must be the case is that Gumb was initially having styx shipped to himself directly from Asia while he was living in Calumet City, Illinois. When he met Frederica Bimmel in Chicago and found out from her about Mrs. Lippman's house in Belvedere, Ohio, which is closer to the East Coast than Calumet City, he decided to move into the Belvedere house and switch to atropos, and so had a 'dummy' shipment of styx made via Suriname, to his Calumet City address just before moving out from there, knowing that the eggs would hatch due to the extra amount of time they were in shipment (i.e., due to the re-routing of the shipment through Suriname), and knowing that U.S. Customs would stop the shipment. This shipment was ordered by Gumb so that anyone investigating the deaths of his victims (i.e, the FBI) would wrongly conclude that he lived in Calumet City, and also, so that Lecter would think he was using butterflies (from Suriname, a country known for these insects). Crawford himself, however, knew that Gumb was in Mrs. Lippman's house in Belvedere because, as indicated earlier in the hidden plot thread, Ardelia had informed him of this. Also stated earlier was that Crawford only feigned surprise when he and the SWAT team found the Calumet City house empty. Note that when Gumb moved from Calumet City to Belvedere, he must have taken a few styx specimens with him; then, once in Belvedere, he continued to breed them. During the autopsy of Gumb's sixth victim, a photo was snapped of the inside of the victim's mouth, so that an attempt could be made to identify the girl by dental records. The photo was developed instantly by the camera used to take it, and when Starling looked at the photo, she told the other members of the team that something was inserted in the girl's throat. Shortly after this, it was made evident that the photo would be faxed to the FBI's missing persons department. Gumb must have found out from someone in the FBI's missing persons department who was working with him, that Raspail's head was found in Lecter's storage unit; for Raspail would have been listed as a missing person after having been killed by him. Once Gumb knew Raspail's head had been found, he figured the moth cocoon he inserted there might eventually be found by someone examining the head. Since Gumb believed that a dummy shipment of styx would 'cover' him if Lecter were to find out that a styx moth cocoon had been inserted in Raspail's head, what must be the case is that the cocoon in Raspail's head was of species A. styx. In fact, Gumb must have found out about the discovery of the West Virginia girl's body itself, and the autopsy of it, from the same person in the FBI's missing persons department as just mentioned. Gumb figured the cocoon would be found during the autopsy on the girl, and not only did he not want Lecter to discover that it was a specimen of A. atropos that had been placed in her mouth (due to the symbolism of this species, as described above), but also, he did not want the FBI to know this, so that they would believe he was still living in Calumet City, as stated. Above left: It is in the basement of this house in Belvedere, Ohio that Jame Gumb is holding Catherine Martin hostage. This is the former residence of Mrs. Lippman. Above right: Jame Gumb's abandoned home in Calumet City, Illinois. This is the house that the authoriites (Jack Crawford and a SWAT team) go to. The fact that it actually was an A. styx specimen that was found in Raspail's head, implies that the insect biologists didn't need to lie about this cocoon, which makes sense when we consider that it couldn't have been Starling herself who brought the cocoon found in Raspail's head to the biologists, because she told Lecter, who was imprisoned in Baltimore, that this cocoon was found "an hour ago"; one hour is not enough time for Clarice to have found out about this other cocoon, brought it to the Smithsonian, and then made the trip from Washington to Baltimore. She must have gotten the information about it via phone communication with someone else at the FBI. (Both the FBI, and the Smithsonian Institution, where the biologists work, are located in Washington.) The point is that since Starling was not the one who brought the biologists this second cocoon, she wouldn't have been there to spot any visual difference between it and the cocoon found in the W.V. girl's throat; and since whoever examined it would not have been lying in saying that it was styx, no one else who may have seen the cocoon, e.g., another expert, would have gotten suspicious either. Implicit in the foregoing is that Lecter could not have thought that Gumb was to use either butterflies or moths based on his having seen an object in Raspail's head when he was putting it in his storage unit - Lecter must not have known there was a cocoon in Raspail's head until Starling told him that one was found there; for if Lecter had seen this cocoon, he would have known it wasn't from a butterfly, since butterflies spin chrysalis's, which look different from caterpillar moth pupae; and Lecter was familiar with the life cycle of these insects, as indicated by knowledgeable statements he made on the topic during Starling's third meeting with him. As described earlier, when theorizing why it is that Gumb had thought he could use the small thigh of Clarice Starling for the eighth and final patch of skin for his suit, one must remember that his attempt at creation was a bungling one, and thus, it's not completely surprising that he would have considered this as a possibility when Starling showed up at his door. In fact, it must be the case that Lecter knew Gumb was botching things, and that he sent Starling to Gumb knowing that Gumb would think he could use her thigh; in other words, Lecter sent Starling to Gumb with the idea that Gumb would have an additional reason to want to kill her (other than just that she was investigating the girls' deaths), and thus, that Gumb would have sufficient reason to let Starling into his home. As we've said, Lecter desired that Starling lose the confrontation with Gumb. Lecter must have realized Gumb was botching things when he studied the file Starling passed him, and noticed sloppy behavior such as the ineffective weighting down of Frederica Bimmel's body. Even if Gumb had killed Starling, he would not have been able to use her thigh, since it was too small, so he would not have been able to pre-empt Lecter's planned resurrection anyway. Lecter sent her to Gumb knowing her thigh was too small, and he figured that once he was resurrected, Gumb's overall plan would have failed. A photograph of Frederica Bimmel from the Buffalo Bill case file. Bimmel was the first girl killed, and the third found. The reason Jame Gumb weighted down down the body of Frederica Bimmel was to trick Lecter, as stated earlier, not so that the authorities would not be able to trace their way to Gumb from having found body and tracing it to Bimmel's hometown; for recall that neither Bimmel's father, nor her good friend, Stacy Hubka, knew about Gumb; thus, the only 'tracing' that could have been done was precisely that 'accidentally' done by Starling, to Mrs. Lippman's house. There was nothing tying Bimmel to Gumb, so Gumb's weighting of her body had nothing to do with his not wanting to be traced through her. Basically, Gumb 'owned' Frederica from the moment he met her in or near Chicago. When he found out she was a tailor, he became friendly with her and had her teach him that trade, and then when he found out from her about Mrs. Lippman's house, he took Frederica captive, then a little later, he killed and skinned her. The decayed body in the tub in Mrs. Lippman's house was that of Mrs. Lippman herself; Gumb had killed her, then place her body in the tub. As already indicated, Ardelia was the one who told Crawford that Gumb was living in Belvedere, and she was some kind of opportunist: she was not working solely for either Gumb, or for Crawford and Lecter, but was instead placing herself so that when things were over, she would appear to have been on the winning side. 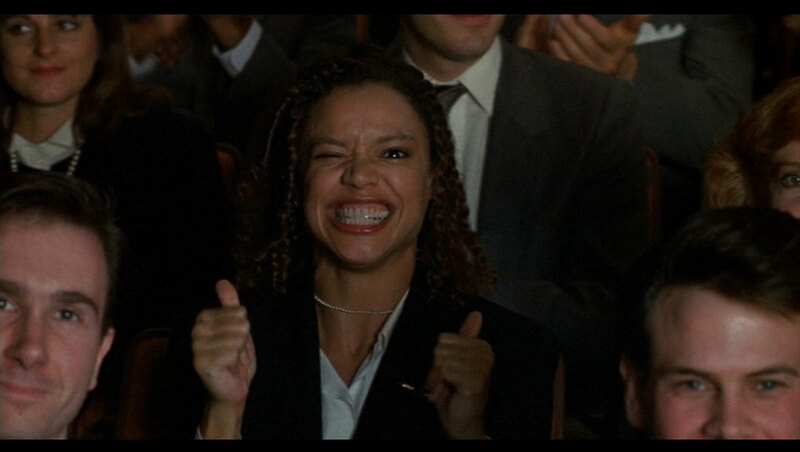 The fact that Ardelia, here sitting in the audience of Starling's FBI academy graduation ceremony, gives Clarice a congratulatory gesture, does not mean that she has been working on Clarice's side; she is here simply going out of her way to pretend that she has been on Clarice's side (all along). Crawford and Lecter knew Gumb would find out from the newspapers, that Bimmel's body had been found, and they still wanted Gumb to believe that the FBI was 'one victim short', i.e., that they only thought there were five victims, so that Gumb wouldn't panic and hurriedly kill Catherine Martin and then another girl, before Lecter could escape and then resurrect himself. Therefore, knowing that Ardelia had access to the case file (including the map of victims), since Clarice was keeping it in her dorm room, and knowing that Ardelia was leaking information to Gumb, Crawford didn't mark the West Virginia girl (the sixth victim) on the map. Crawford knew Ardelia was functioning, in part, as a 'spy' for Gumb, and he (Crawford) used her in an attempt to mislead Gumb into thinking the West Virginia girl had not been found yet. Ardelia didn't know that Crawford knew, that not only was she not working solely for him, but also that she was leading Gumb to believe she was working solely for him. It was only later that Lecter himself made a mark on the map, in West Virginia. It was the above-mentioned person in the missing persons department, who let Crawford in on the fact that Ardelia was working with Gumb. a. Dictionary of Symbols. Ed. Jean Chevalier and Alain Gheerbrant, Trans. John Buchanan-Brown. London: Penguin Group, 1996. p. 140.
b. Jung, C.G. The Collected Works of C.G. Jung, Vol. 9, Part 1. Princeton University Press, 1969. para. 202.
c. Krickeberg, Walter, 'Les religions des peupels civilises de Mezo-Amerique', in Religions amerindiennes, translated from the German by L. Jospin, Paris, 1962.
d. Dictionary of Symbols, p. 141.